Arctic permafrost is thawing. What does that mean for the North — and the rest of us? A geological time bomb is ticking beneath the Arctic ice — one that could be triggered by rapidly rising temperatures. The North is heating up twice as fast as the rest of the globe and has reached a threshold of warming that is unmatched in modern times. As a result, permafrost, the frozen soil and rock that covers about 25 percent of the land in the northern hemisphere, and 40 to 50 per cent of the land area in Canada, is beginning to thaw. In fact, permafrost soils are warming even faster than Arctic air temperatures. Studies done by the Arctic Council indicate that the permafrost has warmed by two degrees Celsius in the last 30 years and that 20 per cent of it may thaw by 2040. Warming permafrost poses numerous problems. Not only does it weaken the ground, creating cracks and craters and playing havoc with infrastructure, it can also affect regional ecosystems, altering the chemistry and flow of water and what types of plant and animal life can thrive in an area. Most alarming of all, a huge cache of greenhouse gases that has been frozen for thousands of years could be released by the thaw. The release of heat-trapping gases accelerates global warming, which in turn causes more thawing. The great fear is that this self-reinforcing cycle could eventually create a calamitous “tipping point,” at which the cycle of warming permafrost will be impossible to stop. Here’s a look at seven possible outcomes of thawing permafrost that have scientists concerned. As Arctic permafrost warms, the ground grows mushier. Roads and buildings constructed on once-solid ground are now exhibiting signs of settling and cracking. In Norilsk, a Siberian mining town located north of the Arctic Circle, melting permafrost has deformed an incredible 60 per cent of existing buildings. In addition to such slow-moving wrecks, there are other areas in the Arctic where the land has completely collapsed, producing massive craters and thermokarst lakes, formed when ice-rich permafrost melts. Rising temperatures are known to spur carbon release, but many experts now believe that changes in soil moisture conditions from wet to dry are apt to have an even stronger impact on permafrost carbon feedback. The danger was vividly illustrated in 2007 when a section of Alaskan permafrost caught fire and smoldered for several weeks. Covering some 90,000 hectares, the Anaktuvuk River fire was the largest recorded on treeless Arctic tundra and twice the size of all previous Alaska tundra fires combined. According to a 2011 article in Nature, the fire spewed as much carbon into the atmosphere as the tundra had stored in the previous 50 years. The globe’s permafrost contains an estimated 1,500 billion tons of carbon. That is four times the amount of carbon that has been released into the atmosphere from all fossil-fuel combustion and human activities since 1850. At present, the majority of northern ecosystems take in more carbon than they emit. But rising temperatures and drying caused by climate change will shift this balance, as much of this organic material is concentrated within three metres of the surface in thaw-vulnerable soil. A thicker, warmer and drier active layer will activate microbes during summer. Significantly later freeze-ups of this layer in winter and warmer winter temperatures will also enhance microbial activities. This enhanced process of decomposition will produce more heat and, in turn, more carbon dioxide. Large amounts of methane are stored in the Arctic in natural gas deposits, permafrost and in crystallized form on the seafloor. Because methane is normally released slowly over long periods of time, it was not previously regarded as a serious concern, but global warming has caused scientists to re-evaluate the threat, because once methane enters the atmosphere, it traps 30 times more heat than carbon dioxide. According to Scott Dallimore, a scientist with Natural Resources Canada, changes in the Arctic landscape caused by permafrost warming have “opened up windows that are allowing the leakage of ancient methane deposits from deep within the earth,” an occurrence that scientists did not believe was likely to come to pass. 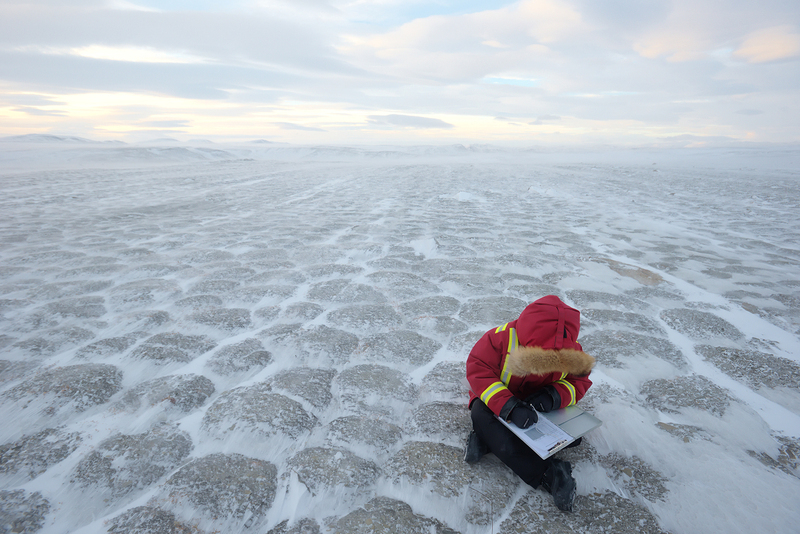 In a study published in 2017 in Nature, German researchers tracked methane seeping out of deeply thawed permafrost in Canada’s Mackenzie River Delta. These seeps were found to be releasing 17 per cent of all the methane in the region, even though the emission hotspots make up only one per cent of the surface area. According to a recent study published in the journal Geophysical Research Letters, there are more than 121 million litres worth of mercury, or the equivalent of about 50 Olympic swimming pools, stored in Arctic permafrost. That is twice the amount of mercury in the rest of all soils, the atmosphere and ocean combined. If the permafrost melts, where will this mercury go, and how quickly might it make its way into the environment? Whether in the Arctic soil or in the broader environment, mercury can be converted into a form lethal to wildlife, including marine animals. If absorbed into the food chain, mercury could also put humans at risk, especially in Arctic communities that depend on subsistence hunting. To the growing list of hazards hidden in permafrost, we can add 67 billion tons of nitrogen. New research shows that permafrost melt could cause nitrogen to be released as nitrous oxide, a greenhouse gas 300 times more powerful than carbon dioxide in warming climate.. Until recently, the impact of nitrous oxide emissions was thought to be negligible. But a recent study by Scandinavian scientists published in the Proceedings of the National Academy of Sciences suggests otherwise. Samples extracted from frozen peatland were thawed out and then measured for nitrous oxide emissions. Although emissions from wet and vegetation-covered permafrost changed little as they thawed, bare permafrost released five times more nitrous oxide when warmed. The barren peatlands most vulnerable to releasing nitrous oxide cover one quarter of the Arctic. Frozen permafrost soil is the perfect place for bacteria to remain alive for long periods of time, perhaps as much as a million years. This means melting ice could potentially open a Pandora's box of diseases. Since 2004, four ancient viruses have been uncovered in previously frozen soil and it is conceivable that something deadly to humans might one day emerge from a long, icy hibernation. These viruses could be released by way of melting ice or by human activity that penetrates deep into the permafrost — oil drilling, for example. Some even claim that viruses might spring to life from the remains of long-extinct hominin species such as Neanderthals and Denisovans, both of whom inhabited Siberia and were riddled with various diseases.